Who can resist a luscious creamy peanut butter and chocolate treat? This spectacular Peanut Butter Tagalong Dip mimics the classic flavors of the famous Girl Scout cookies! I love when my fondness for reading and cooking coincide. Hosting my book club each year is such an occasion—and the perfect opportunity to test out new recipes. 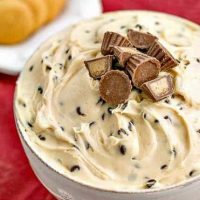 My friends Carla, of Chocolate Moosey, and Miriam, of Overtime Cook, were hosting the second annual Chocolate Peanut Butter Day, and this Tagalong Dip seemed like a good nosh while we discussed our latest selection. Thank goodness my friends are willing to be my guinea pigs. This group of bright, articulate and caring women have been meeting monthly since my youngest, Nick, was 3 years old. He’s now a junior in college. We’ve been through lots of life’s milestones together, as well as loads of books, food, and, of course, wine. 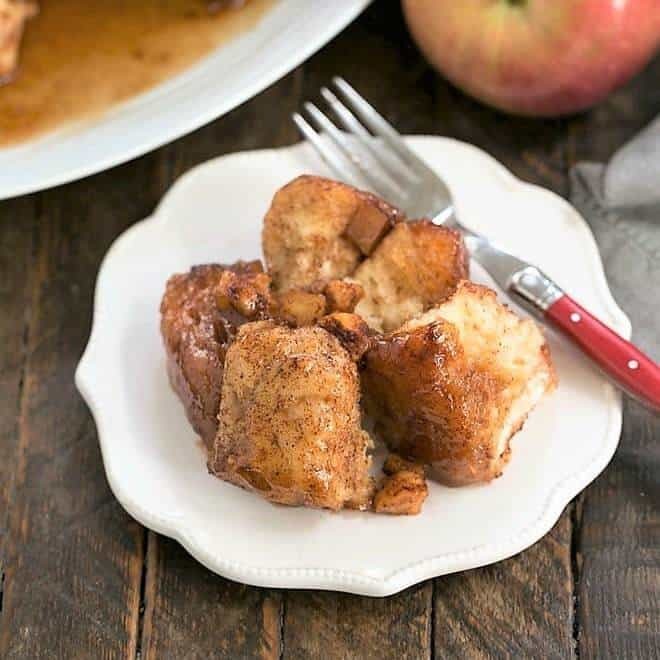 Over the next month or so, I’ll share many of the sweet and savory dishes I served. For those of you fellow bibliophiles, here is a list of the books we’ve read over the last two decades. 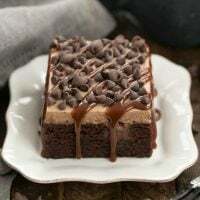 Since March 25th was Chocolate Peanut Butter Day, I knew I’d need to serve a decadent treat using this classic combination. We are a house divided when it comes to this classic combination of flavors. My two oldest love everything Reese’s, where Nick and the hubby like their peanut butter on sandwiches only. 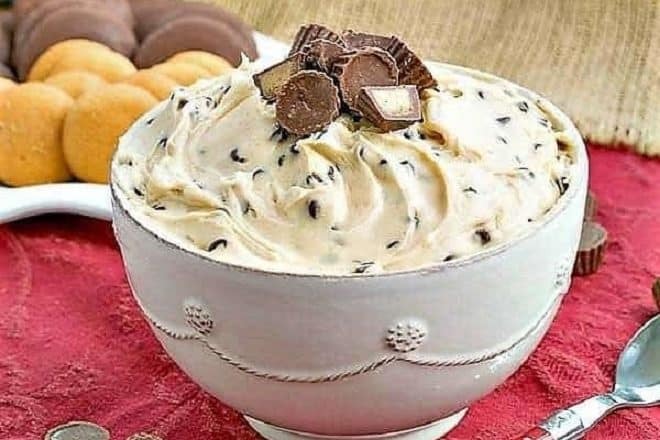 I’m in the former category, so have been antsy to make another dessert dip after the success of my Cookie Dough Dip a couple years ago. The concept was quite similar, mixing butter, sugar and cream cheese. But adding some creamy peanut butter and mini chocolate chips provided the quintessential combination. My version was flavored with a modicum of peanut butter, perfect for my palate. Feel free to taste, then add another 1/4 cup or more for stronger peanut butter flavor. Vanilla wafers and Tagalong cookies were used as dippers, but graham crackers would also suffice. If you’re on Team Chocolate and Peanut Butter, you’ll swoon when you taste this chocolate peanut butter Tagalong Dip. My family also loves this Peanut Butter Chocolate Mousse Cake, these Homemade Reese’s Bars, and these Rolo Peanut Blossoms. I think you will, too! 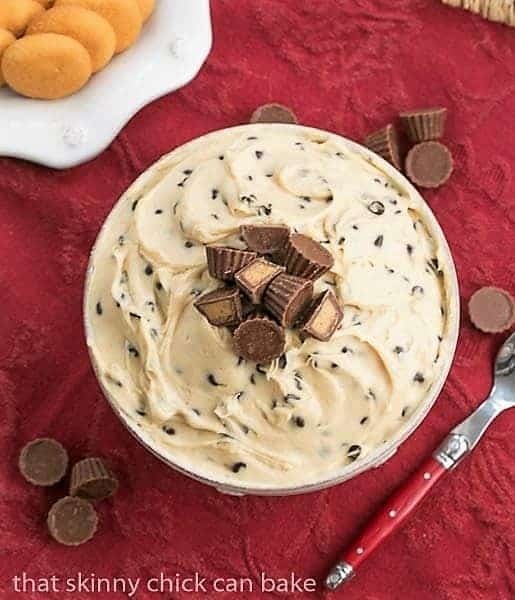 If you are a fan of Reese’s or any dessert with the combination of chocolate and peanut butter, you’d better check out all these terrific treats! From cookies to bars to cakes and more, there’s certain to be something you’ll want to make! 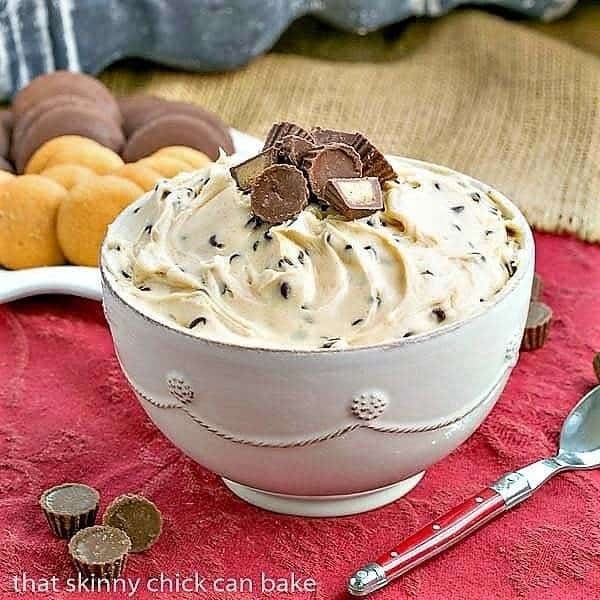 A dessert dip with the classic flavors of the chocolate-peanut butter cookie made famous by the Girl Scouts. With hand held mixer, whip together cream cheese and butter till smooth. Add peanut butter and mix till combined. Add powdered sugar and vanilla and mix well. Stir in chocolate chips by hand. Garnish with mini-peanut butter cups or more mini chocolate chips, if desired. Serve with cookies of your choice as dippers. Updated to give a range of peanut butter amounts for those who want a more intense peanut butter flavor. Start with the smallest amount, taste, then add more to taste. This dip has 2.0’s name all over it! 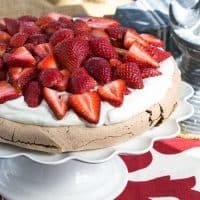 Mmmm… Now that is a great dessert dip for a party! I love that there are only 2 steps to making this dip a reality to my taste buds! I am totally drooling chocolate and peanut butter creation! Time to dip all the things! Pinned! A dip? With cookies and wafers to dip into it? Wicked! You mention serving with cookies of your choice? Drat; my choice was simply going to be a spoon! Love the flavors with the tang of cream cheese; a winner for sure Liz. 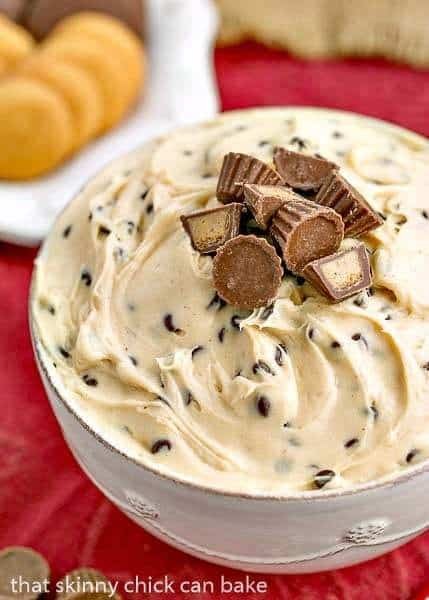 Oh yea, peanut butter dessert dip is the best kind of dessert dip! Is it an acceptable dinner option? I’m definitely a fan of Reese’s. Love the combo of chocolate and peanut butter. So I’d be living by this bowl of dip if it was available to me. Just fair warning. 😉 Good stuff — thanks. This is the best combo ever! I would wipe this bowl clean all by myself. Oh, man! Forget dippers, just hand me a spoon! I have a cupboard full of Girl Scout cookies at the moment but would much rather this dip! Yum! I LOVE Tagalongs and this dip looks so creamy and smooth and rich! Chocolate and pb is seriously the best combo ever! Love this dip! Pass the spoon over please!! I just want to dig in! It looks crazily delicious. Get out! That looks SOOOOOO good!!! We have the same thing here, the boys like the combo and Mark likes peanut butter only on sandwich bread. Now he eats chocolate and he eats peanut butter so we can never figure out why the combination of the two don’t work for him. Go figure. Funny that Bill is the same way. 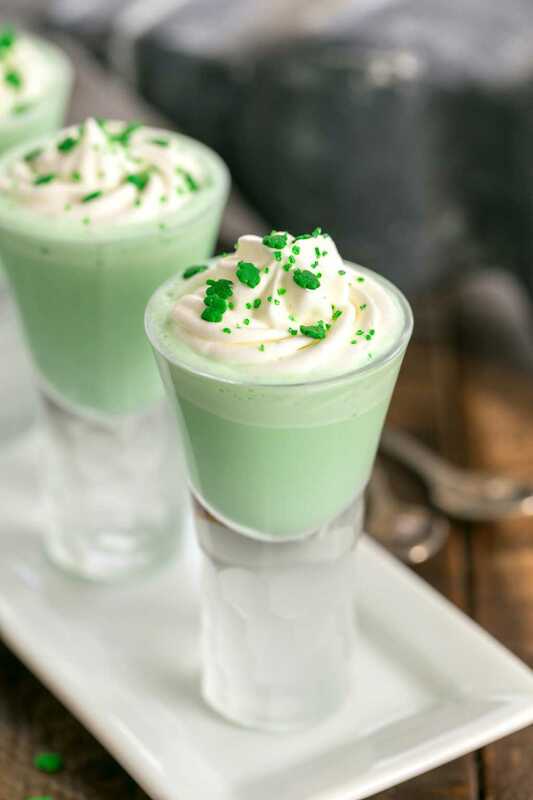 It all looks like a great way to serve it all up! Oh boy – that looks absolutely delicious Liz!!! Perfect for the Easter buffet table! What you say we have a dip date, Liz?! After all, two bowls are better than one! I think this would also taste great on bananas! This is dangerous stuff for me. I am downloading that list in the hopes I can find some good new books. Thank, Liz! This is such a fun dip, Liz! Chocolate and peanut butter is the best combo! A fun dip to share with family and friends! I may just have to make this for my brother’s birthday – he’d devour it! You’re fortunate to have such a strong support group. This looks like HEAVEN, Liz! I adore Tagalongs and I know I’d flip for this dip! Pinning! I am swooning, Liz! How very fantabulous that you have lifelong friends with whom you have enjoyed good books, wine and your gorgeously good desserts! What a delicious dip Liz…I can imagine how this must taste…creamy, buttery…yum! Great combination! Tagalongs dunked into Tagalong DIP – over the top chocolate peanut butter goodness!! I’m definitely on team peanut butter with chocolate! This dip looks very dangerous–and perfect for a party. Holy yum Liz!! I make something similar minus the peanut butter. That must be mind blowing. 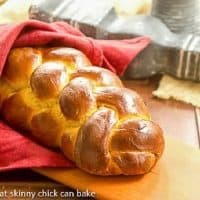 I must try your recipe this looks amazing. Please pass me a spoon because all I want to do is dig into this dip! I don’t think I could share this with anyone, what an amazing dip this is. I love it! I’ve always wanted to join a book club but I’m too flaky to commit. I love that you bonded with such an incredible group of voracious readers…although I’m sure you’re delicious treats are 90% responsible for keeping them coming 😉 This tagalong dip would be so dangerous to have in my house, Liz. It looks so rich ‘n creamy! 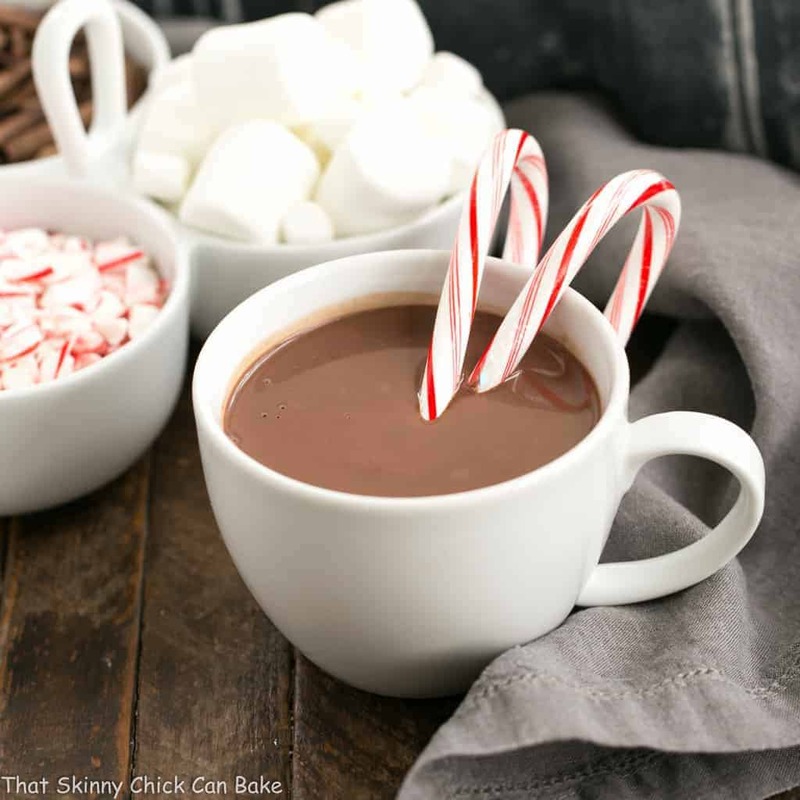 I love that you went outside the box with such a creative recipe for this year’s ChocPB Day! Never mind the cookies to dip. I could eat this with a spoon, Liz! I love your list of books as well. I spy a few of my favorites and some that I’ve been meaning to read as well. How fun when you’re serving this to a group of friends. I can just imagine everyone standing around this dip oohin and aahing at how delicious it is! Love this Lizzy! Look amazing!!! Does this really take 8 oz. Of cream cheese? Just made this and my whole fa mily thought it was awful. All we could taste was cream cheese. Maybe I did something wrong? Lol. Looked good though! Oh, I’m so sorry to hear it was a disappointment, Rebekah. Yes, that’s exactly how I made it. My family and friends enjoyed it–it may be a matter of taste. You could definitely add another 1/4 cup of peanut butter and another 1/2 teaspoon of vanilla to give it some more pb oomph. Thanks for your honest review! I’m ready for dipping into this bowl! Forget dipping, this will meet my spoon! We would see the bottom of this bowl quickly! I don’t need a dipper. Just give me a spoon! YUM! First, I don’t trust anyone who doesn’t like chocolate and peanut butter! Second, your book club list is amazing. How wonderful to have such longlasting friends! I think I am going to use it to find new books. Maybe “book club books” is my genre of what I love to read. I added honey to this to make it taste like a honey roasted peanut butter dip. I also added a little bit of salt to bring out flavors of everything. Tag-a-long is probably my fav GS cookie. Grumpy loves the Samoas. 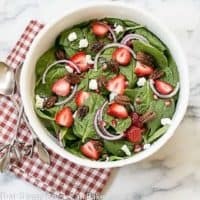 I know this dip would be a hit!